Even for those not intimately familiar with the Attack on Titan property, you can see at a glance how much fun a video game would be set in that universe. Featuring a cast of characters strapped to a piece of equipment that basically emulates the web-slinging powers of Spider-Man pitted against giant, genderless beasts who exist who exist only to eat humans, the “Titan” in Attack on Titan, that sentence alone probably already has you at the very least curious. 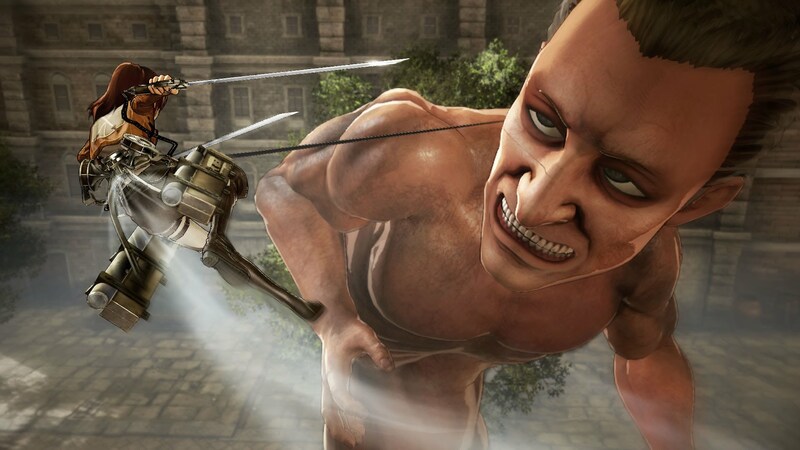 The concept was tried once already in the best forgotten Attack on Titan: Humanity in Chains, exclusive to the 3DS. 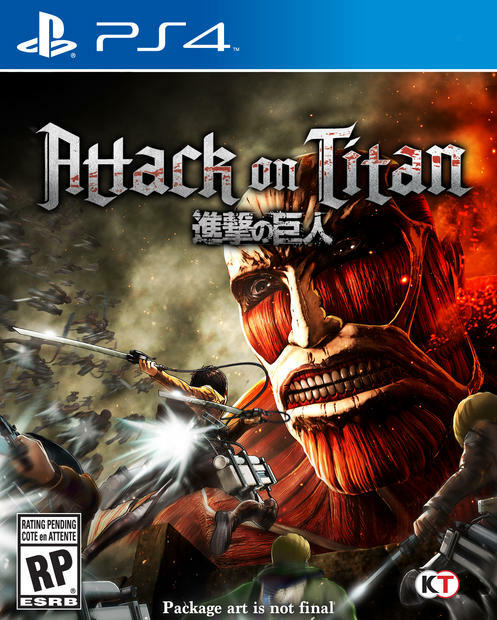 Now it’s Koei Tecmo and developer Omega Force’s turn to take a stab at the nape of the franchise for its first console outing, simply titled Attack on Titan, a game that can get repetitive in extended sittings but is nonetheless a terrific action game for both fans and non-fans alike. In the world of Attack on Titan, humanity is pushed to the brink of extinction after the sudden appearance of the human devouring Titans. To stave off demise, three giant walls are erected, creating the last safe colony for the population free from their would be destroyers. That is until one day a Titan unlike any other, known as the Colossal Titan, appears and destroys the outer wall of the new colony, once again pushing the human race to an inevitable demise. A small group of people affected by the tragic return of the Titans dedicate themselves to ending the threat of the creatures and fight for the day when humanity can roam the world free of the prison of their own making. Attack on Titan’s scenario covers the first major arc of the manga that was also the focus of the first season of the anime spin-off as well. Even if you don’t know who Eren, Mikasa, Levi or the various abnormal Titans are, you should have no difficulty understanding the plot through the main seven-to-eight hour or so campaign. Story is told via mixture of in-game and FMV cut-scenes that capture the look and feel of the source material superbly, from the way the characters look and emote to the early-eastern inspired architecture and giant tree forest. The vocal track is strictly Japanese which isn’t an issue unless you’re really adverse to reading, but it does pose somewhat of an issue when characters start speaking to one another during missions and it’s way to difficult to focus on playing the game and reading at the same time. Thankfully all useful tips come up via in-game tutorials that stop the action and can be recalled anytime in the pause menu. The developer behind this game, Omega Force, is primarily known for the Dynasty Warriors franchise, or the more recent Hyrule Warriors, where you face against hundreds of enemies on-screen at once an while there can be quite a few Titans surrounding you at any given time, thankfully the numbers don’t reach those of the games Omega Force is traditionally associated with. The missions take place within enclosed arenas, but unlike Humanity in Chains, there’s plenty of room to maneuver whether you’re on the offensive or just simply or just majestically swinging around. In small spaces the camera at times has a lot of difficulty tracking your character against your gargantuan foes, but these instances don’t kill the experience nor cause that much frustration. Outside of the urban environments, there’s also forests and flat plains that change things up significantly as your locomotion is reduced to horse back. 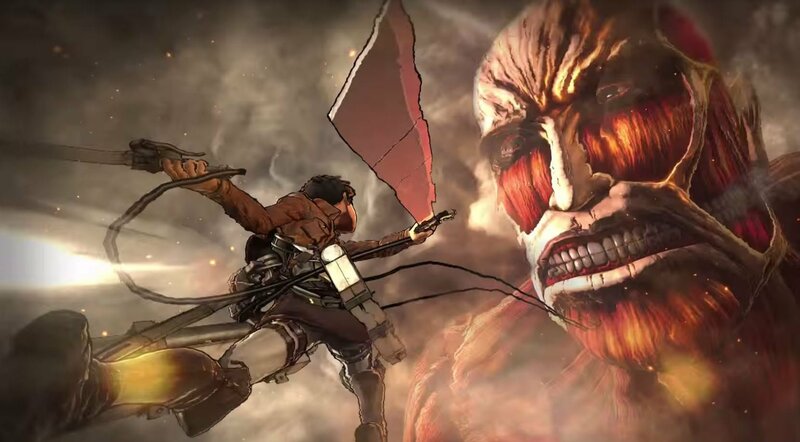 The hook, no pun intended, of Attack on Titan is the ODM, or Omni-Dimensional Movement gear, a device strapped to the user the launches two grappling hooks that allows fast horizontal as well as vertical movement and a way to strike at the nape of a Titan’s neck, which is the only way to eliminate them permanently. What this basically means is that fans of any Spider-Man game post Spider-Man 2 are in for a treat. The mechanics of movement are very easy to understand, and after a brief training mission and a few skirmishes it won’t be too long until you’re flying gracefully through the air and dispatching Titans like it’s second nature. Your gear runs on a consumable gas that drops upon use and the sharpness of sword similarly lessens unless replenished. There’s rarely an instance where the game will leave you without either resource, and should you run out, soldiers will arrive on the map to aid you. 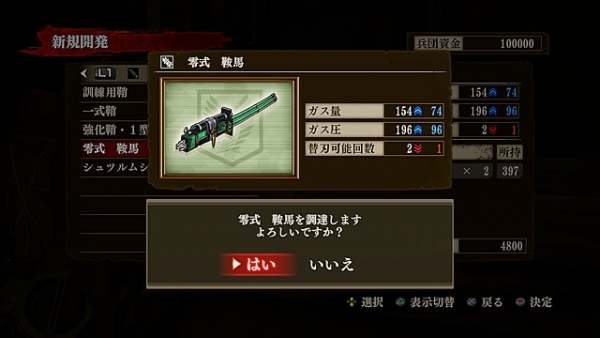 Other items include a flash and sound grenade which at first don’t seem helpful, but are invaluable in later missions when weak points cannot be targeted unless an enemy is subjected to one of these devices. Reducing the number of enemies on-screen is the goal, but it’s always not best to strike for the nape right away. With the press of a trigger, you can target a Titan’s nape, as well as their arms and legs. Sometimes resources can be found within limbs that you’ll be notified of when you’re locked onto them. These resources can then be combined with other ones gathered by completing missions with higher grades to build more powerful equipment, as well as upgrade the equipment you already have. While it’s very incredibly fun to zoom around the environment clearing out enemies, the task can still get somewhat repetitive and having this risk/reward resource collection thrown in makes things much more interesting: Should you use your resources to take down as many as you can, or do you have enough where you can afford to hunt for what could be the part that’s responsible for making your character stronger? What’s also particularly great about the upgrade system is that when you finally buy a new tool, you can then fold your previous one into the stats of whatever you just purchased, making you more wiling to experiment. The main campaign takes place over four episodes, each with multiple chapters, where you’ll play as the most popular characters from the series, each with their own strengths and weaknesses. Levi is the one of the most powerful fighters, but lacks an ability gained by another character that changes up the gameplay quite a bit (I’m keeping this vague as it can be a story spoiler if you haven’t read either the manga or watched the anime). Being familiar with the series, one character who admittedly I wasn’t looking forward to playing as, Armin, turned out to be a pleasant surprise. When using this character you’re much weaker than anyone else, but gain the ability to command troops you enlist in the field. Using this character made hunting for resources much easier as you can select multiple soldier to attack joints you normally had to focus on by your lonesome. Though there’s plenty of Titan hunting to be found, there’s enough variation within the campaign to keep things interesting. Sometimes you’ll have to lure enemies to specific traps, for example, and side-missions constantly spawn that you can also complete should you wish. Often it is in your best interest to do so, as more item holding reinforcements will be added to the battlefield and powerful characters will also join you and can help turn the tide in your favour greatly. If you want to take a break from the story, you can do so by undertaking secondary missions, however the way they’ve been implemented within the game could have perhaps been handled much better. The secondary missions are far less interesting than the primary story missions and there’s simply too many of them. They don’t last very long, but they’re far too large in number and better rewards are given only if you spend more time just mindlessly killing Titans than going after the main objective which can make them artificially longer. You don’t technically have to do most of these missions, however there’s a post game epilogue of five extra missions that features encounters that should get fans invested in the property very excited that only unlocks once you’ve spent enough time grinding through these missions. Completing the campaign also unlocks character requests that are given between missions that will require you to complete a certain amount of side-missions or kill a certain amount of Titans with a high enough proficiency. This perhaps should have been something that happened much earlier, as by the time I got through the campaign, I had enough bonus missions done to unlock the entirety of the epilogue and missed out on the character specific scenes that occur when you complete a quest line. Having these as added incentives would have been helped reduce the tedium of having to do a lot of the secondary content for the true ending of the game. You can always leave all the post campaign content until you’re done, but I at least found it much more tolerable to get through it when broken up between doing a main objective or two.